Prosthetic limbs are prohibitively expensive for anyone, but when it comes to young kids they are especially difficult to afford. Most insurance companies won’t pay for them because kids grow out of prostheses so quickly, and it isn’t often you find a family who can shell out another $10k every year or so. 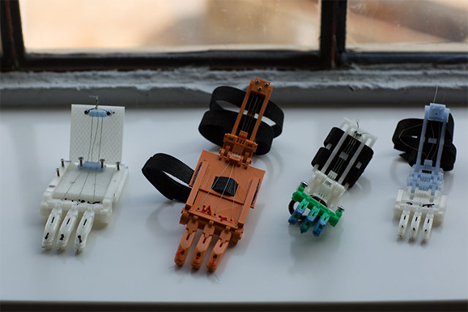 Alabama engineering firm Zero Point Frontiers is shattering the typical prostheses business model by creating 3D printed prosthetic limbs for a tiny fraction of the cost. The hand from Zero Point Frontiers costs a shockingly small $5, meaning that it is cheap enough to mend or replace when necessary. 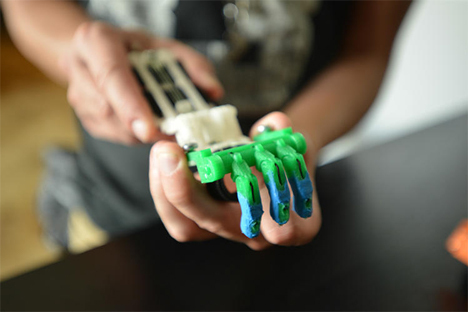 A new one can be made in a single day, as opposed to the weeks or months it can take to produce and calibrate a new conventional prosthetic device. Made of only plastic, screws, and bungee cords, the device is simple enough to fix. Zero Point Frontiers plans to launch a Kickstarter campaign that can take their wonderful design from concept to reality. See more in Cybernetics or under Technology. October, 2013.